US President Donald Trump hoped for "great things" from his second meeting with North Korea's Kim Jong Un as he paid a courtesy call on his Vietnamese hosts. Mr Kim was expected to take in some sights before the leaders open their second nuclear summit with private talks and a social dinner. Anticipation for what will come out of the summit is running high in Hanoi. But the carnival-like atmosphere in the Vietnamese capital, with street artists painting likenesses of the leaders and vendors selling T-shirts emblazoned with their faces, stands in contrast to the serious items on the agenda: North Korea's pursuit of nuclear weapons and peace on the Korean Peninsula. "We have a very big meeting planned tonight as you know, with North Korea, Chairman Kim, and I think it may very well turn out to be very successful," Mr Trump told the top leaders of Vietnam. "I look forward to the meeting tonight with Chairman Kim and hopefully it's going to be successful. 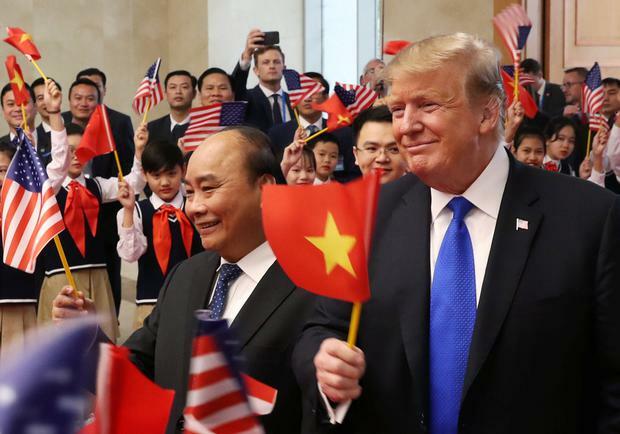 "We'll see what happens, but he wants to do something great," Mr Trump said, adding that Mr Kim could use Vietnam as a model for economic revitalisation. "Vietnam is thriving like few places on earth. North Korea would be the same, and very quickly, if it would denuclearize," Mr Trump tweeted on Wednesday, hours before he and Mr Kim were to meet again. Mr Trump said at a separate meeting with Vietnamese officials that "hopefully great things will happen later on with our meeting" with Mr Kim. Mr Trump and Mr Kim first met last June in Singapore, a summit that was long on historic pageantry but short on any enforceable agreements for North Korea to give up its nuclear arsenal. North Korea has spent decades, at great economic sacrifice, building its nuclear program, and there is widespread scepticism that it will give away that program without getting something substantial from the US. That could be a declaration to end the Korean War. While Mr Trump wants Mr Kim to agree to dismantle his nuclear sites in a verifiable way, Mr Kim is seeking relief from crushing US sanctions hobbling his economy. Other items being discussed are opening liaison offices in both North Korea and the United States. North and South Korea also want sanctions dialled back so they can resurrect two major symbols of rapprochement that provided much-needed hard currency to North Korea: a jointly run factory park in Kaesong and South Korean tours to the North's scenic Diamond Mountain resort.